Share this product and receive a $3.65 sharing discount. 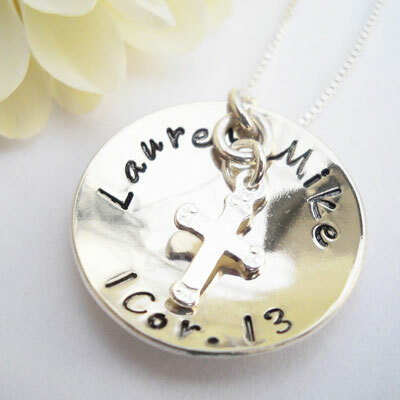 We hand stamp two names up to ten characters each on this gorgeous sterling silver pendant and add the Love Bible Verse of "1 Cor. 13" to it. Makes a perfect gift for new bride, newly engaged couple, wedding anniversary, bridal shower gift or any couple who needs to be reminded of this beautiful bible verse about Love. 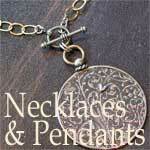 We attach a tiny sterling silver cross to the pendant and then to a sterling silver delicate 18" box chain necklace. We then add the couple’s names to two laminated 1 Corinthians 13 Blessing Cards with their names at the bottom. The first card is temporarily attached to the front of our beautiful, velvet lined gift box and the second card is inside with the pendant. Both cards are removable so of the couple can carry these small cards with them wherever they go! Disc pendant is round, about 7/8" and is then gently cupped for a delicate touch that catches the light just perfectly.